One heavily used command in Linux by all system administrators is the "ps" command. This command outputs the process table and complete details of all the process running on a Linux system. Another such tool with a more interactive interface for process monitoring is "top". The main reason why i mentioned "ps" and "top" command is the fact that iftop command is very much analogous to the very famous "top" command, with the only difference that iftop command gives you a complete network usage statistics instead of process. System Libraries used by iftop command are as below. Libcurses for operations on terminals. I will recommend reading the below post for libpcap & tcpdump packet analysis. If you have epel yum reposotory enabled then you can simply do a "yum install iftop". Otherwise you can download the source package tar file from iftop website. Simply unpack the tar file and run the below commands inside the iftop directory to install it. Simply running the iftop command will give you an output something like the below. In the above shown example output of iftop command, we can see traffic send to and from the host "myvm1", the direction of traffic send and received are shown by "=>" and "<="
By default the output is sorted from highest using to lowest using. So its quite easy to determine the host using highest traffic from one look at the output. the last three columns you see is the output for bandwidth usage in the last 2,10 and 40 seconds. One major fact to note in the output is that, it will show you the traffic from the first network interface card. 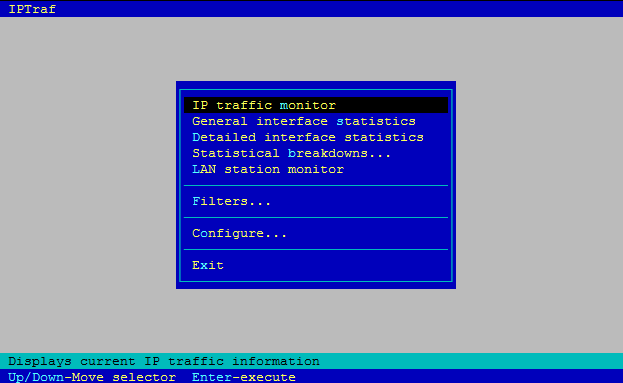 For displaying traffic summery for network interface card of your interest you need to pass interface name with "-i" option in the command line as shown below. As i mentioned before, iftop by default will display host names in the output. If your server is a high traffic server, doing a name resolution for each and every ip iftop finds, will itself generate a large amount of packets, which can make the output slightly deviated(as iftop will count each and every packets through an interface). So its always better to suppress hostname resolution from the command line itself, which can be done by the following method. Using source and destination port options is always helpful in finding the process using the source port on the server.You can ask iftop to display source and destination port with "SHIFT + s" and "SHIFT + d" interactively. You can clearly see that the source port is "ssh" and the destination is an arbitrary port on the gateway server. You can always find the process using a port with the help of lsof command in Linux as shown below. The last row of the iftop output shown the received and transmitted traffic(RX and TX) for 2,10,and 40 seconds, with the grand total of the both. Further details of command line options for iftop can be found from its man page. Iptraf is much more detailed in its output compared to iftop command. Iptraf shows traffic summery based on the protocol of the traffic. It shows the summery for tcp,udp,icmp,ip traffic in its output. It also comes handy to find out checksum errors in the packet send and received. Otherwise you can get the RPM package from here and install it using "rpm -ivh" command. Simply running "iptraf" will show you a menu interface exactly like in the below shown picture. Selecting "detailed interface statistics" will show you complete details of number of packets per protocol and checksum errors transmission rate and receive rate etc.The output is quite elaborate as shown below. Selecting the option "Statistical break downs" will allow you to get a sorted output based on "packet size", as well as "TCP & UDP ports". This is a nice method, to determine if you are hit by an attack, because most of the times, attackers send large number of packets with large packet size. A complete list of command line options for iptraf can be found from the iptraf man page. Could anyone advise on the method used by iptraf to calculate Peak values? Iptraf minimum measurement interval is 60 sec. It prints out Average and Peak kbps values. So I assume iptraf would measure kbps value per ~5 sec intervals and then print out the max as a the Peak value. Very good explanation of the tool. Very helpful. Its very help full for has . Thanks, helped me to undersand this awesome tool.